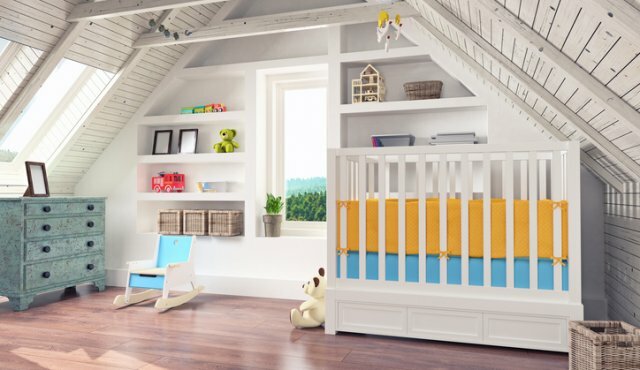 Creating a nursery can sometime be an overwhelming task, fortunately we can help you get a start on planning your baby's new room. Here are a few tips on how to setup a baby's nursery. Downsize. Babies are small and don’t need to be in full-sized cribs to get a good night’s sleep. A fold-up crib (think Pack n’ Play) is one low-profile option, and there are also mini cribs whose mattresses measure approximately 24" x 38" instead of the standard 27" x 52". Multitask. This one is obvious but still worth mentioning because it’s one of the best solutions for small spaces: Use a dresser as a changing table. Choose a bureau that hits about waist-high, and then simply put the changing pad on top. (If you’re worried about the pad sliding off, you can buy special boxes, rails or fasteners separately.) Store diapering supplies close at hand but out of sight in the top drawer, and when you’re through with diapers altogether, you still have a useful piece of furniture. Get vertical. If you need all your drawer space for baby’s clothes, store diapering supplies and other must-haves in a shoe organizer that hangs flat against the back of a door. Diapers, creams, powders, lotions, nasal aspirators, pacis, a thermometer – each item can fit into its own see-through pocket. Share the space. Shoe racks that hang from closet rods are great for organizing baby clothes, whether they need to fit into a small closet or a shared one. Don’t waste valuable rod real estate by hanging each tiny onesie from a separate hanger when you can store a dozen or more outfits vertically in the same space. Store smart. If your baby’s nursery is truly tiny, chances are you won’t be playing in it a lot. Don’t crowd the space with things you won’t use in the space. Reserve the nursery for things baby needs only at night and during naps (clothes, diapering supplies, blankets, a few bedtime stories, etc.) and keep everything else (toys, play mats, bouncers, bath supplies, etc.) in another room or closet. Trick the eye. Is there a safe space to mount a mirror on your nursery wall (not above the crib or changing table, for instance)? If there is, even a small mirror can bounce light around the room and make the space feel bigger and lighter. Hide the clutter. If you have lots of odds and ends that need to be kept in the nursery, use closed storage to keep the clutter out of sight. Shelves without doors look lovely when they’re styled with a few special items but downright messy when they’re piled with a bunch of random stuff. Using boxes or baskets on open shelving can also solve this problem. Edit. You want your baby’s nursery to be functional, but you also want it to be warm, inviting and nice to look at. When it comes to decorating, streamline your design by including fewer pieces you adore instead of packing the room with stuff you only kinda-sorta like. And donate/store/trash everything you don’t love.